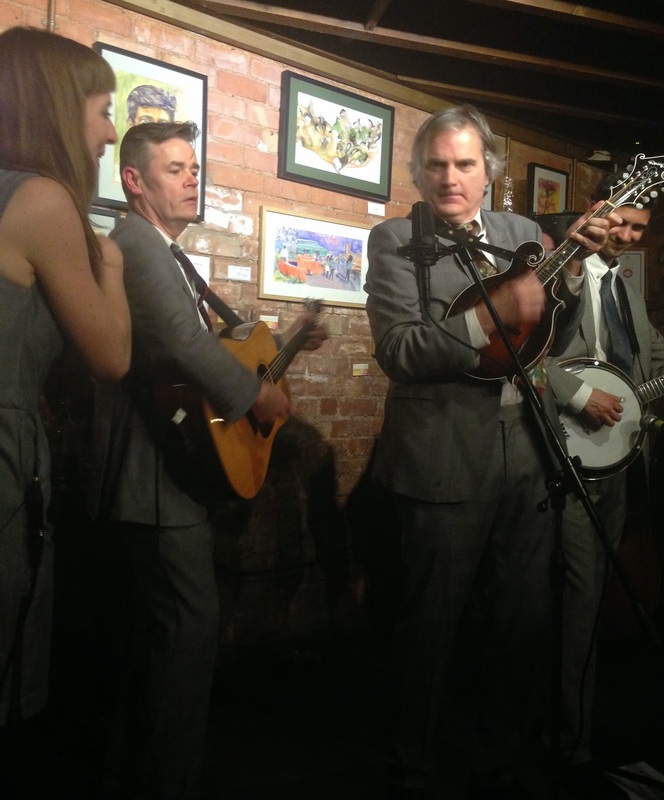 London based alt bluegrass band The Coal Porters have been plying their trade for many years but have admitted that for far too long they have not been active enough in the West Midlands. Well the Kitchen Garden Café has been hosting roots gigs for several years now so it is great that both band and venue have finally connected. Packed to its intimate capacity, the Café was alive tonight with the fantastic sounds of this highly talented quintet who uniquely manage to make bluegrass music significantly progressive. 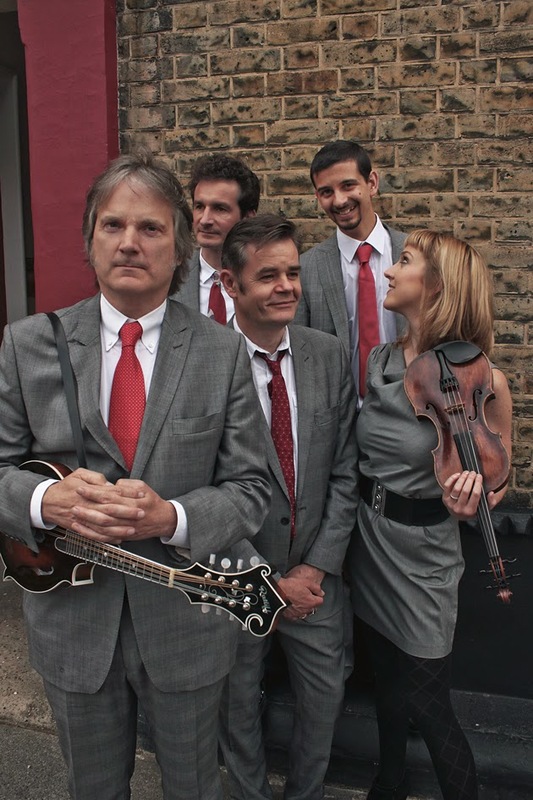 The Coal Porters are led by the former frontman of the esteemed US alt country rock band the Long Ryders, although Sid Griffin has a lot more to his cultural arsenal than an eighties cover slot on the NME. He has assembled a wonderful set of musicians to bring many original compositions to life alongside several imaginative covers that you would not expect to hear at a gig steeped in this music style. Sid, in a dry and slightly quirky manner, led the band for a twin pair of outstanding sets spanning several of their album releases including the latest titled FIND THE ONE, which unsurprisingly he was keen to plug. From this 2013 release, the sold out audience were treated to such gems as ‘Barefoot On The Courthouse Lawn’, ‘Never Right His Wrong’, ‘Gospel Shore’ and the splendid instrumental ‘The Betsey Trotwood’. The latter being a tribute to the established London roots venue of the same name, a place dear to the band’s hearts. This fine record also housed a couple of covers which the band played on the night. Their version of Bowie’s ‘Heroes’ has been proving a popular rendition and its performance tonight was spot on, just as the encore decision to give ‘Paint it Black’ a bluegrass makeover. Adele’s ‘Rolling In The Deep’ went down really well with the crowd and a personal highlight was a splendid version of the Only Ones new wave classic ‘Another Girl, Another Planet’. However it was not all about contemporary pop music with a twist as a version of ‘Pike County Breakdown’ respected the traditional side of the genre. Sid was a charming and humorous front guy, excelling on mandolin and bribing potential CD buyers with potential tales of the 80’s LA scene with reference to The Bangles, Dwight Yokham and Fats Domino. However the two sets were an exemplary presentation of roots music, packed with inspired solos, vibrant audience interaction and an unplugged finale of ‘New Cut Road’. Of course The Coal Porters is not just about Sid Griffin, in fact he shares vocals and writing on many tracks with Scotsman Neil Robert Herd. There are also several sublime vocal contributions from Carly Frey along with her dynamic fiddle playing. John Breeze plays some mean banjo and it is somewhat unfair to always leave the bass player until last as the rhythm of Tali Trow kept the sound together throughout the evening. Over the years the Kitchen Garden Café has hosted many fine gigs but it has to be said that a splendid evening in the company of The Coal Porters is right up there with the very best. Having only recently fully explored their work, it was a pleasure to witness them live for the first time and hopefully this will be the rekindling of a beautiful relationship with West Midlands roots music fans.